Builder Finance Inc. is your decisive, one-stop construction lender. 1 4.99% first month, increase 0.5% monthly up to 7.99% max assuming no default. 2 Additional time subject to restrictions. See how much you can get. Application and other required forms. Construction Loan We will finance up to 60% of land costs (plus up to 100% of vertical costs) for qualified builders. Subordination / Seller Financing This is a way to get 100% financing! The land seller is essentially providing seller-financing on ALL the land while Builder Finance may provide ALL the funds for vertical construction. We can work with a land seller to help make this happen by providing necessary paperwork. Land Inventory Loan WORKING ON IT! On a limited basis we plan to eventually offer financing on finished lots. After a loan is approved, the loan amount is set. Total costs minus the loan amount is what we call the “equity”. The borrower fulfills this equity need first. Then we fund 100% of the remaining costs according to an approved budget. The land can cover the equity requirement. Submit a draw request. We fund it then we inspect to confirm completion. See Details for notes and exceptions. We provide up to 5 draws per loan at no cost. If more than 5 draws are needed, we bill you for inspection costs. During the initial term and first extension, all interest and loan fees may accrue to the balance of the loan and be paid off at maturity. With each draw request the GC will provide a General Contractor Consent and Acknowledgement. See Details for how GC fees may be paid by us. We like to work with qualified General Contractors. We can help you win Fee Business. Team up with an investor – domestic or foreign – and we can be your lender. We can help you with your own Spec Projects. If you know how to build and what to build, we would like to be your lender. Start building a relationship with Builder Finance Inc. Let’s work together on fee business and your spec projects. This FAQ is as of August 2017 and is subject to change without notice. This FAQ will supersede any verbal conversations with BFI, but not more recent written communication with BFI. Borrowers are strictly organized as business entities – primarily limited liability companies (LLC’s). We lend for the construction of 1-4 unit, “single-family” homes. Loans for similar but different purposes such as land inventory loans and model homes are available on a case-by-case basis. All lending is strictly for business purposes – borrowers that sell or rent their projects – we DO NOT lend to owner-occupants. More specifically, we finance the construction of for-sale and for-rent real property, primarily one-to-four dwelling units OR more than four dwelling units if each unit is separated from the other units by dividing walls that extend from ground to roof, including row houses, townhouses, or similar types of property. Any non-residential portions of a structure such as ground floor retail will be assigned no value for underwriting purposes. Appraisal +1 business day: contact applicant with loan decision/loan size. Appraisal +2 business days: deliver loan documents. Timing may slip but generally not by more than a day. For us to be this fast, you would need to promptly provide us with required diligence items – especially items needed by the appraisal firm like plans and a budget. Our minimum loan size is $75,000. Our maximum is increasing, so please speak with a loan representative. Loans are sized first and foremost based upon building experience and repayments to BFI. From there, adjustments are made based upon financials, the market, and a background search. 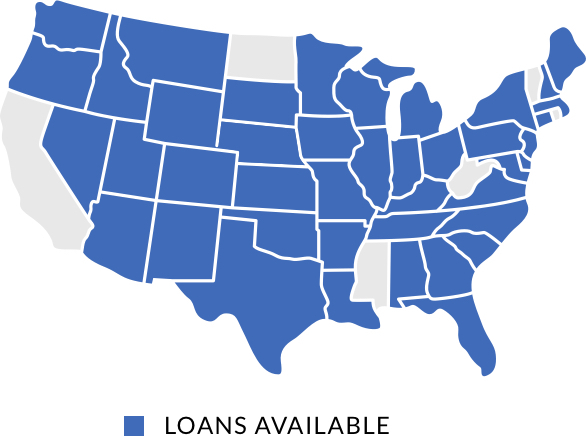 Please refer to our Lending Matrix for specifics. Note that loan size will be constrained to a maximum LTV, the requirement that the borrower have a minimum amount of equity in the project as a percentage of total cost, and that we are not advancing more than 50% of land value. Loan interest and upfront fee stated on our Terms page are essentially set in stone for everyone; an exception is unlikely but not impossible for a high volume of extraordinarily safe loans. Most other costs are pass-through expenses such as title and recording fees. The members of the borrowing entity and/or their general contractor have the requisite building experience. The population within a 3-mile radius is at least 3,000. The population within a 3-mile radius is expected to be roughly flat or to increase over the next 5 years. There are zero felony convictions for fraud or misrepresentation concerning owners of the borrower. There are zero material misrepresentations in the loan application. A loan may also be declined for reasons determined by BFI, at its sole and absolute discretion, on case-by-case basis. Commonly, such declines are based around our belief that the loan would be problematic: unlikely to payoff within 12 months of closing and/or while outstanding likely to require an extraordinary amount of BFI staff time in “hand-holding” or “process clarifications” with the borrower. Note that available loan proceeds may be adjusted based upon a variety of factors. For example, there is no minimum credit score to qualify, but if the credit score is low it may diminish loan size. Refer to our Lending Matrix for details or use our Loan Estimator. Loan documents provide borrowers with an initial period of 8 months, plus one extension option of 4 months, totaling 12 months. An additional 4-month extension (16 months in total) is available subject to: ongoing loan performance, execution of proper extension documentation, and the pay-down of all accrued interest and fees. All extensions are subject to an extension fee. After 16-months BFI will work with a borrower on a case-by-case basis to determine if an additional extension of the maturity date will be granted. That said, unless the property is complete and under contract and/or there are extenuating circumstances such as a hurricane or other Act of God that severely delayed construction, BFI is likely to immediately require at least a partial pay-down of the loan. We will lend to investors that work with qualified general contractors consistent with our Lending Matrix and Loan Estimator. Note that if ownership is comprised of only foreign investors, the maximum LTV is typically limited to no more than 60%. BFI will work directly with qualified general contractors or with investors teamed with qualified general contractors. For the later, BFI will let certain qualifications of the G.C. boost the qualifications of the borrower. Consistent with the Loan Estimator, BFI will consider: the G.C.’s years in single-family construction; homes completed; if part of the G.C.’s income is contingent on sale of the home; the extent to which the G.C. has worked on loans that were repaid to BFI; if the G.C. is bonded; and if the G.C. has a clean background. Yes, we do business through referrals and brokers! We have a simple, straightforward process to compensate referrals. Contact BFI or fill out our Referral Form. After completing a background search that reveals no felony breach of trust convictions, BFI will provide a referral partner with our ICCA Agreement which we would co-sign subject to the terms and conditions of the ICCA. This agreement spells out compensation and, as a written contract, provides peace of mind. For modular projects, BFI makes production deposits and payment loan disbursements directly to the modular manufacturer. BFI will need a letter from the manufacturer stating, among other things, that upon payment of the production deposit, the home will be produced and upon the final payment the home will be delivered and set on site. We can provide the necessary letters / paperwork. There are adjustments to our process for loans made at or above certain LTV thresholds (and/or below certain Minimum Equity thresholds) – all of which are consistent with our Lending Matrix. At or above 70% LTV (and/or below 15% Minimum Equity), BFI may fund the 5 largest budget line items directly to the supplier(s), trade(s), and/or general contractor. At or above 74% LTV, BFI may fund all draws directly to the supplier(s), trade(s), and/or general contractor. BFI may limit funding for self-performed work. At or above 76% LTV (and/or below 12.5% Minimum Equity), BFI may require full recourse and require that the borrowing entity be a special purpose LLC. BFI may also put a “mezzanine” lien on that LLC. At a minimum, loans are what we call “limited” recourse. Generally, loans below 76% LTV and with 12.5% or more equity will only be limited recourse while others are fully-recourse to each guarantor on a joint and several basis. Limited recourse means that the guarantor(s) guaranty completion of the project and that the loan is otherwise non-recourse to the guarantor(s) with the exception of “bad-boy” non-recourse carve-outs: recourse liability for transfer of any interest in the property or the borrower; the incurrence of any additional debt by the borrower; fraud; gross negligence; misconduct; misrepresentation; inappropriate handling of buyer deposits; misapplication of funds; voluntary and/or involuntary bankruptcy; physical waste of the Property; and the “bad faith” contesting of any foreclosure. If you apply for a loan and the house is already partially built, BFI may be more conservative. Specifically, if framing is already up at loan application, a new borrower will be limited to Level 10 of our Lending Matrix while a repeat borrower (1 or more payoffs) will have to satisfy BFI that it is not taking undue risk. For both a new and a repeat borrower, the loan on a partially built project would be fully-recourse. We require a certain amount of “skin in the game” before we fund. Typically, this most often means the borrower pays for part or all of the land and then we fund all approved costs thereafter. On our Lending Matrix , Minimum Equity is depicted as a percentage of the approved budget. If you will receive seller financing on the land refer to the next item. We finance up to 50% of land value as part of a construction loan. Other types of land financing would be made on a case-by-case basis. Yes, it is possible. We require a certain amount of equity or “skin in the game” before we fund. If you receive land financing (seller financing on the land), it may suffice for “skin in the game” and BFI will fund 100% of other approved costs, resulting in 100% financing for the borrower. We know how to work with land sellers on this. Please inquire for details and eligibility or utilize our Loan Estimator. Please review Draws for details.